By default, Geni displays your tree in a vertical view that allows complex relationships like aunts, uncles, and cousins to be displayed. By pressing the button illustrated above, you can switch the display to show a simplified five generation horizontal representation of the tree. Here is an example of a horizontal display. Back in the default view, you can customize the display farther by going into the Preferences tab. Under the "Generations to Display" column, you can change the number of generations up and down to display. 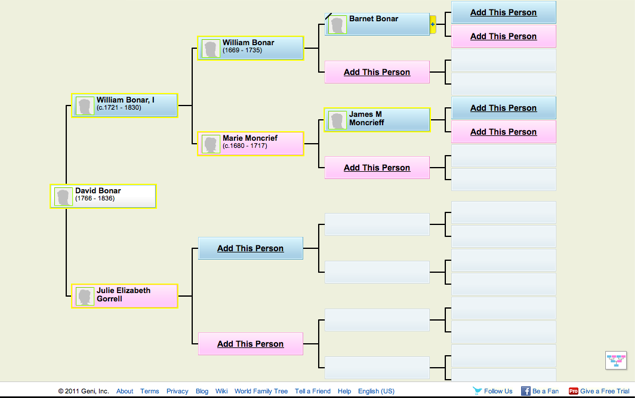 Also, you can toggle on and off displaying only direct ancestors. Under "Tree Layout," you can alter how the nodes display on the tree. "Layout Options" allows you to toggle on many options like "Mark deceased" and "Center Single Parents."